Saudi Arabia, Japan, and Taiwan are calling for Filipinos to apply and work in their country. 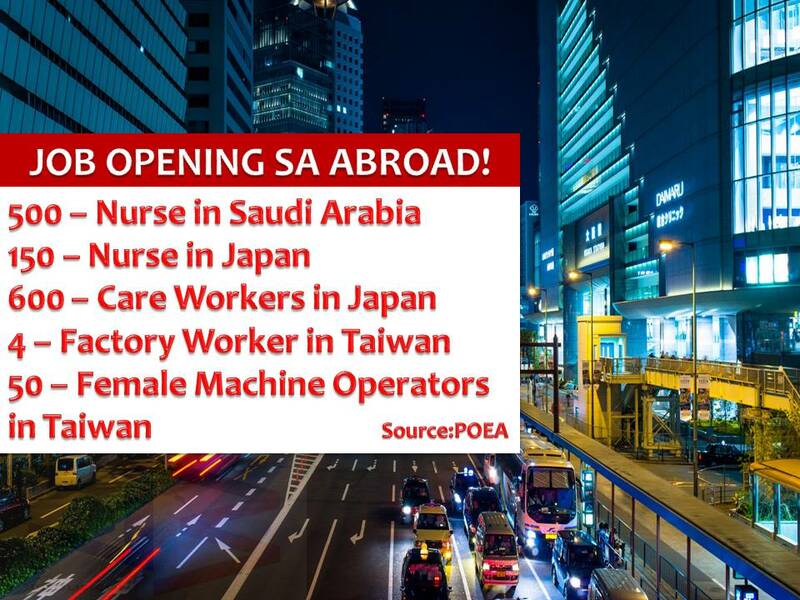 Foreign nurses are in need in Saudi Arabia and Japan while Taiwan is looking for female factory machine workers and factory workers. POEA said, job openings are made possible by government-to-government deals, which guarantee employment to qualified applicants. "Walang babayaran whatsoever except processing fee. P5,000 siguro, mga ganun lang. Kasama na dun yung OWWA, yung PhilHealth," POEA Government Placement Branch Director II Atty. Rosemarie Gondaranios-Duquez said. 1. Three years worth of experience working as a nurse or in a nursing-related field. "After na sila ay ma pre-qualified or selected initially, sila ay bibigyan ng six months para mag-training ng Japanese language. At ang isa pang maganda rito, habang sila ay nagti-training, ay meron po silang natatanggap na allowance at free accommodation," Duquez said. The agency also reminded job seekers that these job opportunities are only available through POEA and be careful of illegal recruiters. FIVE labor attachés are being summoned back here in the Philippines due to some reports that they are not mindful of their jobs concerning issues and situation of distressed OFWs in their area of jurisdiction. The five officials are coming from the Middle East and Taiwan has been ordered by Department of Labor and Employment Secretary Silvestre Bello III to report back in Manila office due to their inaction on OFWs issues. 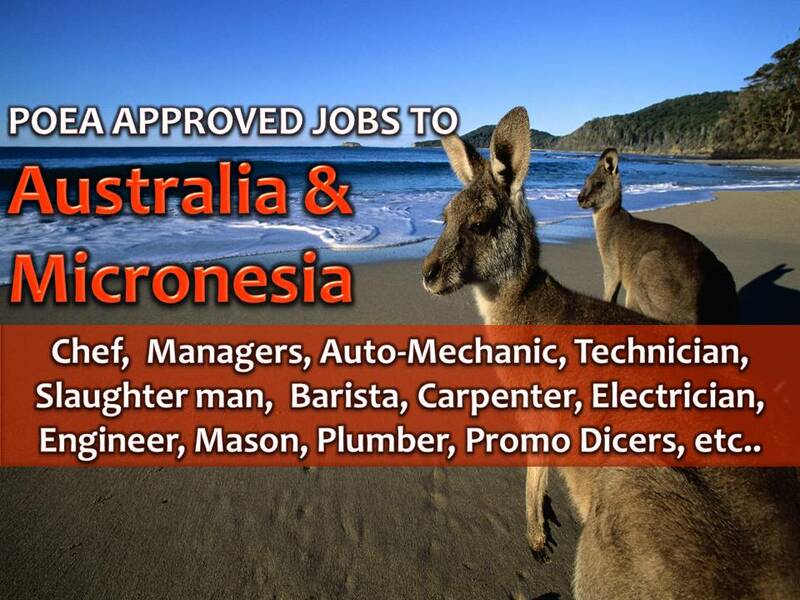 The following are jobs approved by POEA for deployment to AUSTRALIA and FEDERATED STATES OF MICRONESIA. Job applicants may contact the recruitment agency assigned to inquire for further information or to apply online for the job.